RT was launched in Argentina by Russian President Vladimir Putin and then-Argentine President Cristina Fernandez de Kirchner in October of 2014. 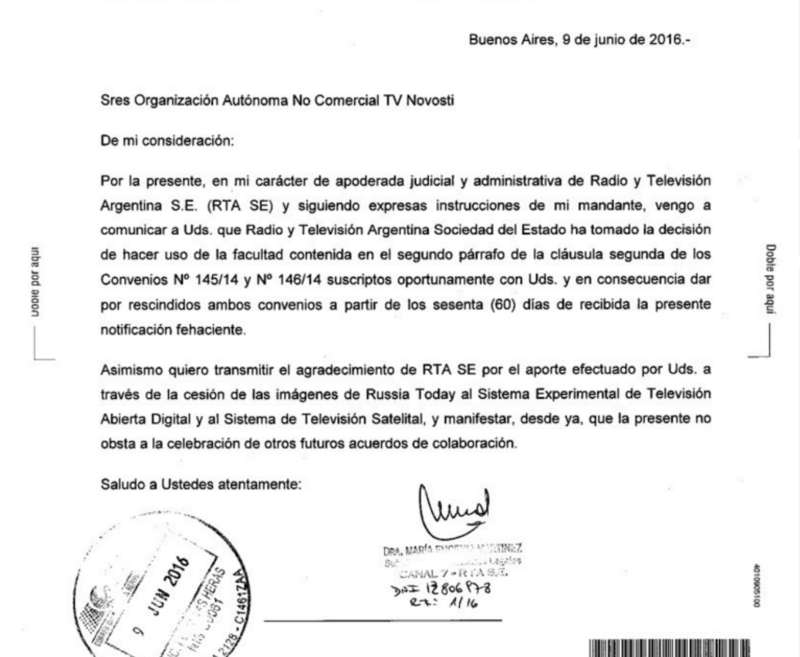 The radio and television chain Argentina Sociedad del Estado (RTA SE), which manages the country’s state media, has suspended transmission of the TV news channel RT as part of national broadcasts. According to an official report, the suspension will take effect within 60 days. The channel will still remain available in paid TV packages. In an official notification posted by RT Spanish, RTA SE's Maria Eugenia Martinez said that the suspension "does not preclude the conclusion of other future collaboration agreements." Martinez also expressed gratitude for the contribution of RT Spanish to national broadcasts. RT Spanish began broadcasting in December of 2009, becoming the first Spanish-language Russian channel in the world. Approximately 80% of Argentina’s population — between 33 million and 35 million people — rely on RT for news.